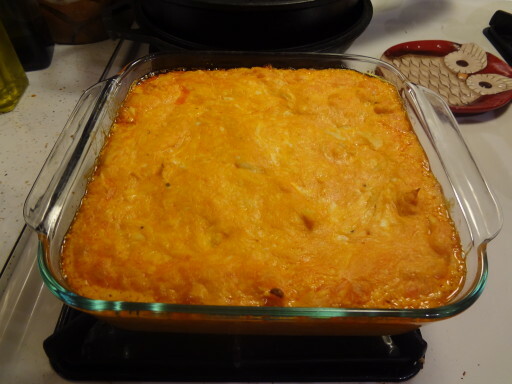 With the Super Bowl this Sunday, I thought it was the perfect opportunity to share my recipe for what is possibly the world’s most perfect Super Bowl food, Buffalo Chicken Dip. This is my go to recipe for any potluck, and I get requests for the recipe all the time. It is easy to make, easy to share, and best of all, absolutely delicious. It’s basically chicken wings, mixed with cheese, in dip form. Hot, cheesy, greasy, with a bit of a kick, I might need to make some this weekend and I’m not even going to a Super Bowl party. 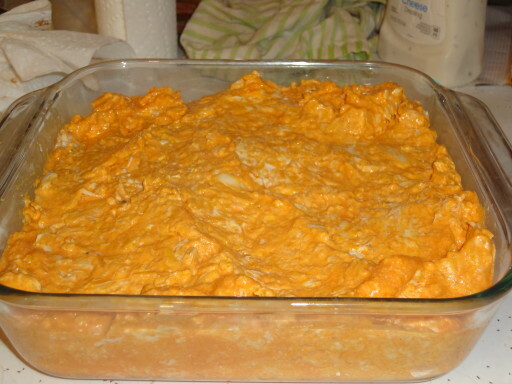 Buffalo Chicken dip starts as chicken, buffalo sauce, cream cheese, cheddar cheese, and blue cheese dressing. I apologize that the below photo looks like a Cub Foods ad. I am not picky about the brand name when it comes to any of the ingredients except the wing sauce, I try to use Franks Red Hot Wing Sauce, but they were out the day I was making this batch. I gave the store brand a shot, it was passable. I also always buy the cheap blue cheese, because you can’t really taste it and it would be a waste of good blue cheese. I’ve had people use ranch instead, which I think is a travesty, but honestly it doesn’t actually taste that different in the end. I also always buy shredded cheddar instead of shredding my own. 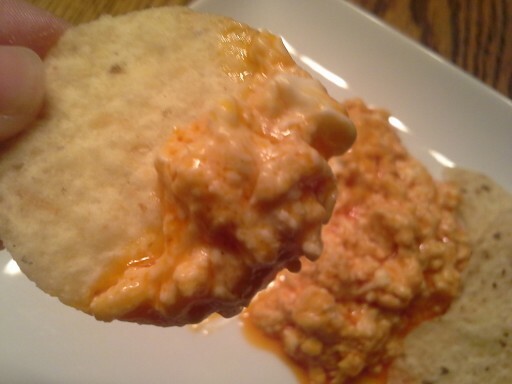 Shredded cheese has an anti-caking agent that actual helps the dip be less greasy, and it will still be greasy enough. 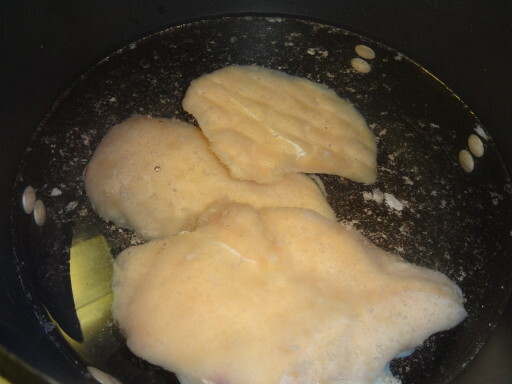 The first step is to cook the chicken. I usually just boil boneless skinless chicken breasts, then shred. If you are looking for really easy, you could use canned chicken, but I like the bigger chicken pieces I get using real chicken. 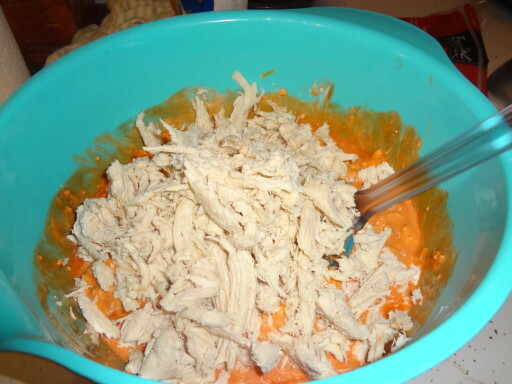 While the chicken is boiling, I soften the cream cheese and cheddar cheese in a large mixing bowl. Just cube the cream cheese, add the cheddar, and microwave in 30 second intervals until the cheese are soft enough to mix into a cheesy paste. This isn’t absolutely necessary, but helps the finished dip have a more homogeneous consistency. Otherwise, the cheeses tend not to melt completely when you bake the dip and you hit pockets of cream cheese and strings of cheddar. 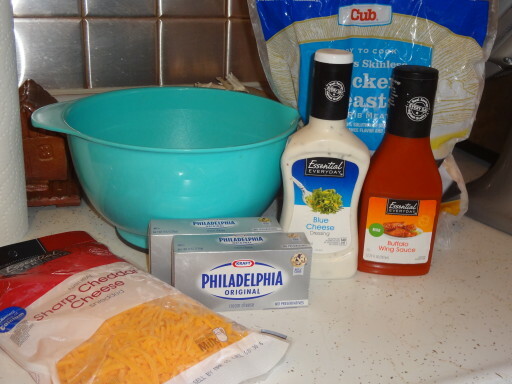 Next, add the wing sauce and blue cheese dressing to my cheese paste and stir it until combined. When the chicken breasts are cooked through, I use two forks to pull them into shreds. Then add the shredded chicken into the wing sauce mixture and stir it in. Lastly, transfer the dip into a square glass pan and bake at 350 for about 45 minutes or until the edges just start to brown. If you are ready to eat it, you can serve it right out of the glass pan. 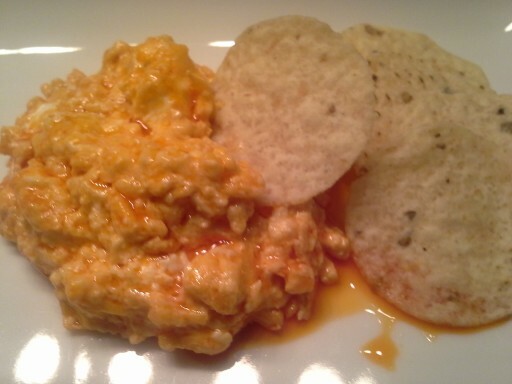 We are usually bringing the dip with us to a party, so we mix it up the night before and refrigerate it overnight. Then we transfer it to a small crockpot to take with us. The recipe actually fits perfectly into our small crockpot and it is a super convenient way to keep the dip warm at a buffet style gathering. I serve the dip with tortilla chips, but I suppose you could eat it with celery if you wanted to be a bit healthier. Sometimes, if we have left overs, we make buffalo chicken wontons out of them. More on that deliciousness later. The best part of chicken wings in dip form. Combine ingredients in a large bowl. Transfer to an 8" by 8" glass pan. Bake at 350 for 45 minutes or until the edges start to brown. Can be made ahead and reheated/kept warm in a small crockpot.